Filtered, Portable, Safe Heat. Wonderfully scaled and comes fully assembled and ready to heat. Built from solid woods and real wood veneers with a multi-step fine furniture finishing process sealed with a protective lacquer for rich color and durable surfaces. Classic traditional design features a beveled edge and molding detail and decorative accent onlays. Concealed casters roll in any direction. Warms A Room Up To 1000 Square Feet. Thermostat Automatically Controls Room Temperature. Balanced Heat Keeps The Temperature Difference Between Floor And Ceiling Within 2 To 3 Degrees. 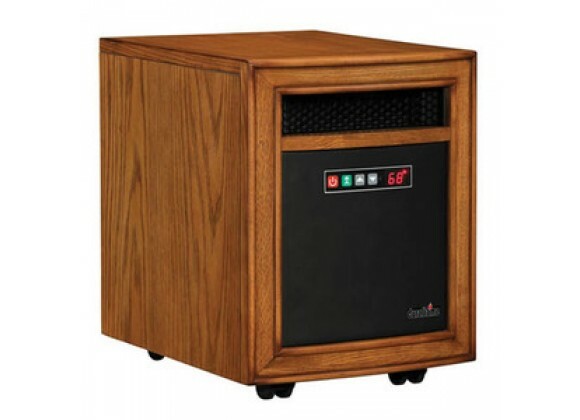 Heat From The Copper Heat Exchangers Combines With The Humidity In The Room To Provide Soft; Moist; Safe Heat Without Reducing Oxygen Or Humidity. Air Purifying Function Through High Efficiency Lifetime Filter. Easy To Remove Filter Can Be Cleaned With Warm Water Or Vacuum. Flocked Heater Grill Stays Cool To The Touch. Color Coated Push Button Controls On Font Panel. Room Temperature Display Range: 50-97_ F.
LED Display With Night Time Brightness Dimmer.